How to make your backyard a paradise for your kids! 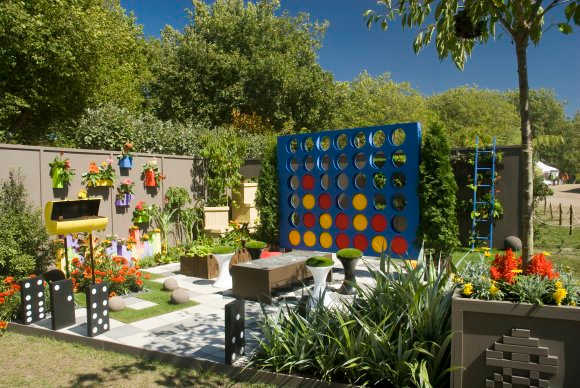 With the sun shining and temperatures climbing, there’s no better time of year to get out and enjoy your garden with your kids. Of course, to really make the most of your outdoor play sessions, you’ll need to have the right gear. We are sharing how to make your backyard a paradise for your kids. Be sure to check out our Patio of your dreams post on tips to make a special area for the adults too. With this in mind, here are some great garden toys and games, which are all available at Tesco, that your family can enjoy this sunny season, and potentially for many years to come. Virtually all children enjoy showcasing their sporting skills, and there’s no shortage of garden equipment on offer that lets them do precisely this. For example, swingball sets can provide kids with endless hours of fun. Because the balls are attached by string to a pole, these games are ideal for front or back yards. You won’t have to worry about anything straying into your neighbors’ outdoor areas. Goal nets are another great choice. These soccer set ups offer the perfect opportunity for the whole family to get active. You might also want to consider getting a trampoline for your little ones. Bear in mind though, if you do buy one of these bouncy platforms, it’s important to ensure you opt for one with effective nets and other safety features. As well as sports equipment, there are a host of other toys for your kids to enjoy in your yard. For example, an array of ready made dens are now available that make the perfect setting for imaginary games. From mini castles complete with realistic stone walls to small circus-style tents, there’s no shortage of options. Themed climbing frames can also help to fire children’s imaginations. Play equipment like this is ideal if you want to encourage your kids to be creative. During the hottest weather, nothing beats a paddling pool. There’s now a range of sizes and styles to choose from, so whether you’re looking for a sizeable pool that can accommodate several people or you want a small version that’s ideal for young kids, you won’t struggle to get what you’re after. There are other ways to cool off with your kids in the summer sun too. From water blasters to inflatable water slides, you can fill your garden with a variety of fun accessories. By making the most of the variety of outdoor toys and games now available, you can ensure your kids stay active this summer. You’ll also get to spend plenty of quality time with your children in the comfort of your own yard. What are some of your kids favorite backyard toys? Wow, this is a kid’s paradise. I’m sure you have to goad your kids to come inside when its time. It’s a great backyard. Great ideas. Where I live I have a shared yard space so having stuff like a pool an trampoline just doesn’t work for us. But I do keep a tote full of outdoor toys, water guns and balloons and stuff like that. I love this, is that your yard? I wish my patio was so bold and colorful.